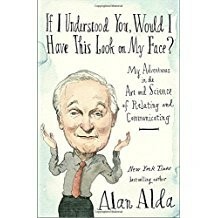 My favourite subjects are communications, science and math so when I heard about a new book from Alan Alda, I had to check it out. Alan Alda knows about those subjects? He certainly does and the book, “If I understood you, would I have this look on my face?” is a highly readable, well researched and fascinating treatise on communications. Turns out, Mr. Alda founded the Alan Alda Center for Communicating Science at Stony Brook University in New York. His interest in communicating science seems to have become a passion during his years as the host of Scientific American Frontiers. The book focuses primarily on spoken word communication. In it Alda talks about the importance of empathy in communications. Empathy in this case, is the ability to tune into other people’s feelings, their present state of knowledge, their level of interest. Alda shows that when we do that as presnters or speakers, we can connect, be understood and be memorable. The book explores many practices to develop empathy to improve your ability to communicate. The practices are backed by current scientific experimental findings by leading researchers as well as practical exercises from the world of improv. Throughout the book, there are wonderful examples of communication techniques like mirroring, active listening, eye contact and of course, storytelling. He warns against the dangers of using empathy as a weapon and language to exclude (jargon gone bad). Understand (empathize, relate) with your audience. Know what you and your audience know, don’t know and want to know. This prevents data dumps, feeling of condescension or total communication shut down. My question of wonder and discovery after reading the book is: how can we communicate empathetically across cultures and languages?